One of the great things about hot rods is how they can be built in so many different styles – perhaps more so than any other type of car out there. 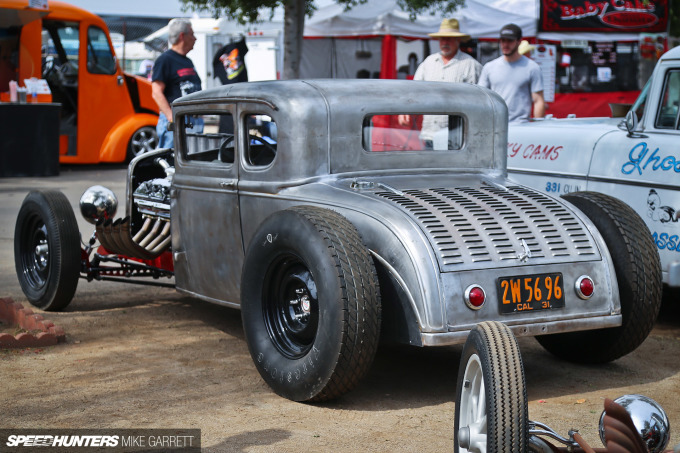 For example, some might like the rusty, outrageous rat rods, some might dig the billet-laden show machines, while others will prefer the functional, race-inspired builds that also pop up. 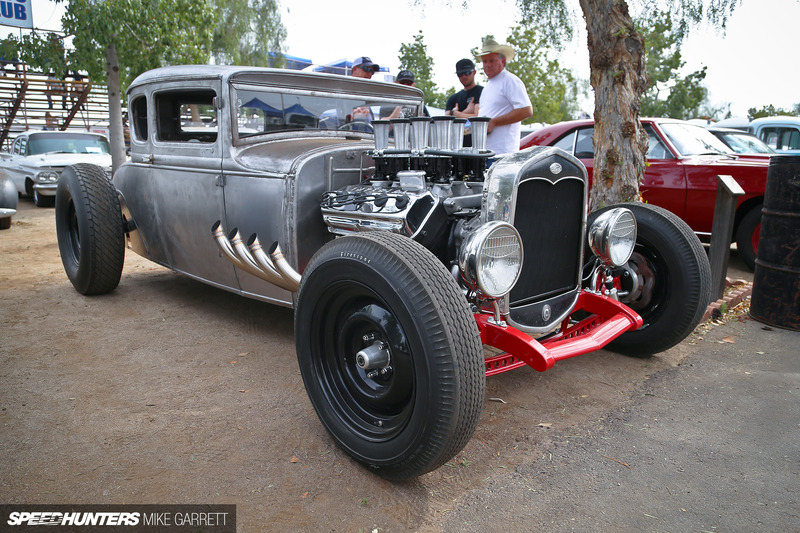 And while I can appreciate all of them, if I had the means to build a Ford Model A for myself, it’d likely come out looking something like this example I spotted at the March Meet a couple weeks ago. 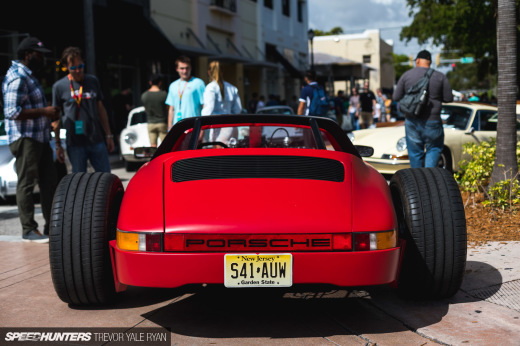 For me, it’s the perfect mix of form and function – chopped and sitting aggressively with some serious and fairly exotic high performance goodies to back up the tough look. 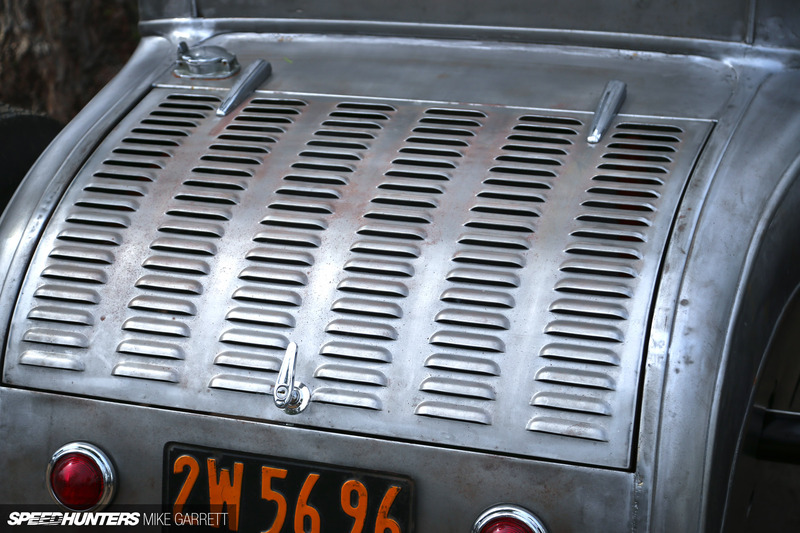 Cars that are finished in bare metal can be hit and miss, but on this coupe it just works – particularly when paired with details like the louvered rear decklid. 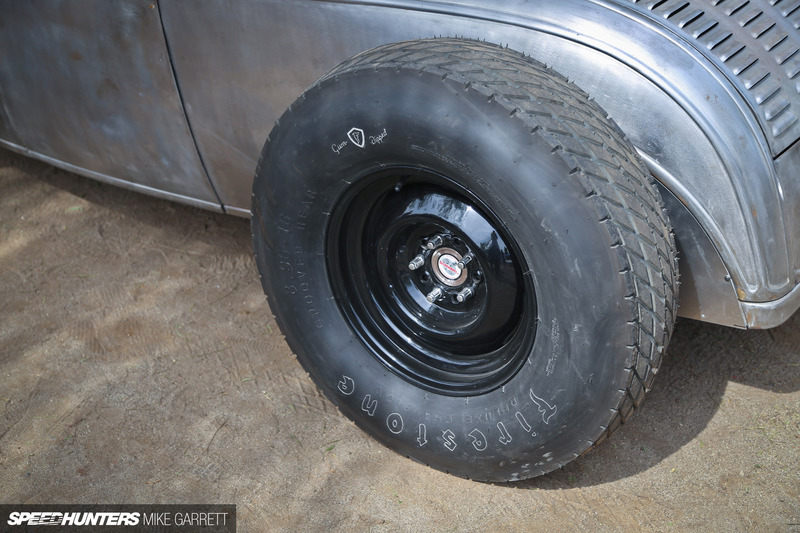 Keeping with the minimalist theme are a set of black steel wheels wrapped with period correct Firestone tires. 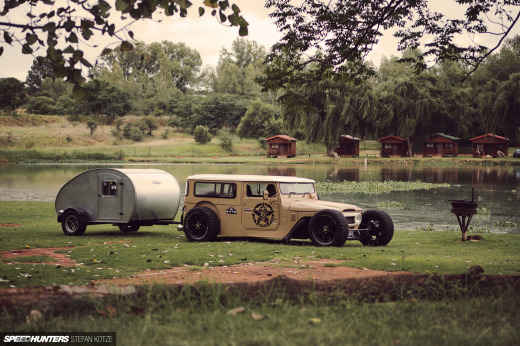 But it’s not entirely an ‘old school’ build. For example, a closer look revealed a set of front disc brakes sitting behind the steelies. Dominating the engine bay is a Chrysler Hemi engine with a super cool set of Imperial valve covers, while induction comes from a set of Weber carburetors which add even more character to the Model A’s engine bay. 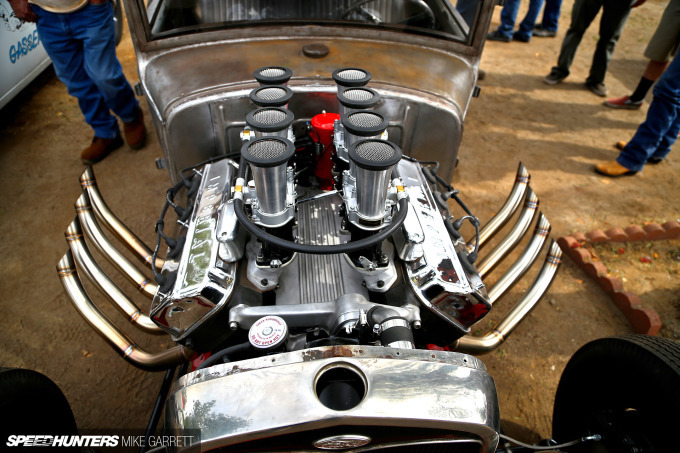 The craftsmanship throughout is just top notch, evidenced by things like the custom-made headers which perfectly complement the Hemi’s exotic carb setup. 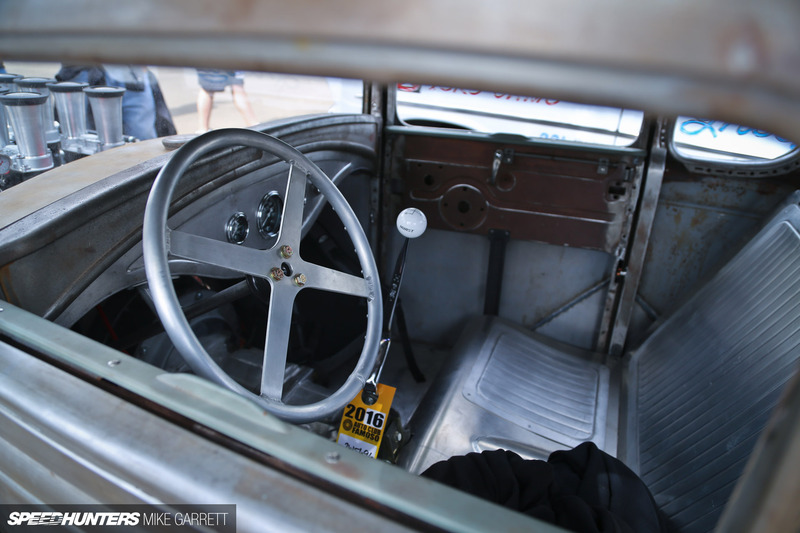 Inside the barebones cockpit (which has zero upholstery), a tall Hurst shifter dominates the landscape; there’s little room for useless trinkets that are there just for looks. 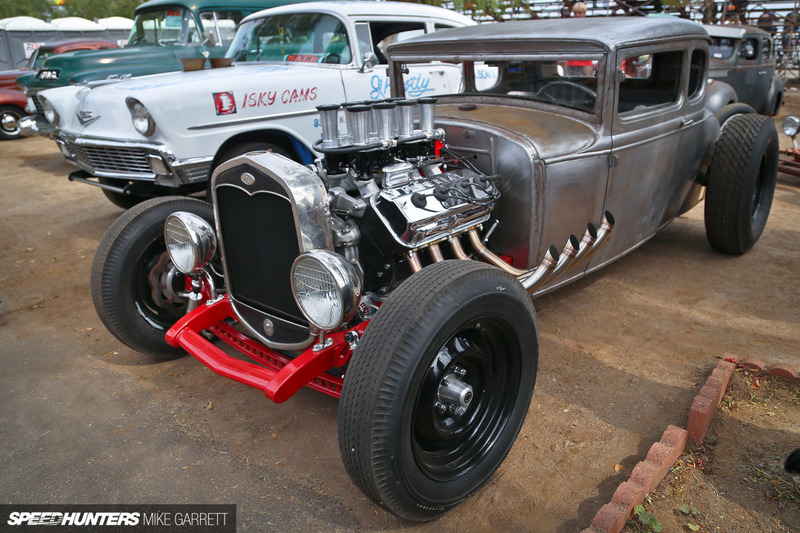 There are a million ways to build a hot rod, but it doesn’t get much better than this. A perfect mix of function and style with no pretentiousness whatsoever. 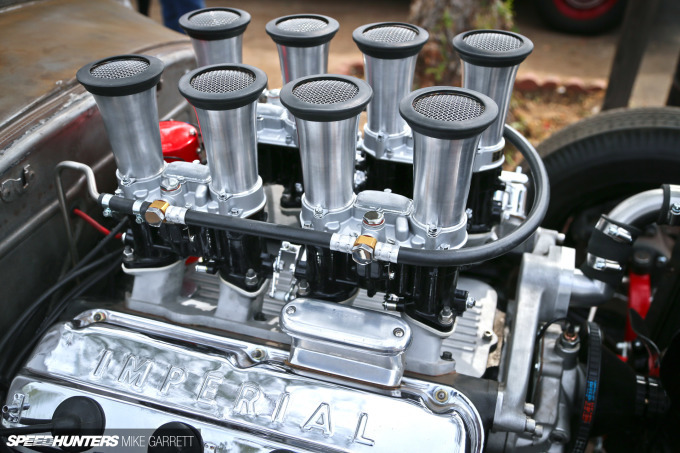 I had to do a double-take on the induction setup...it looked more like Hillborn stacks then Weber carbs. 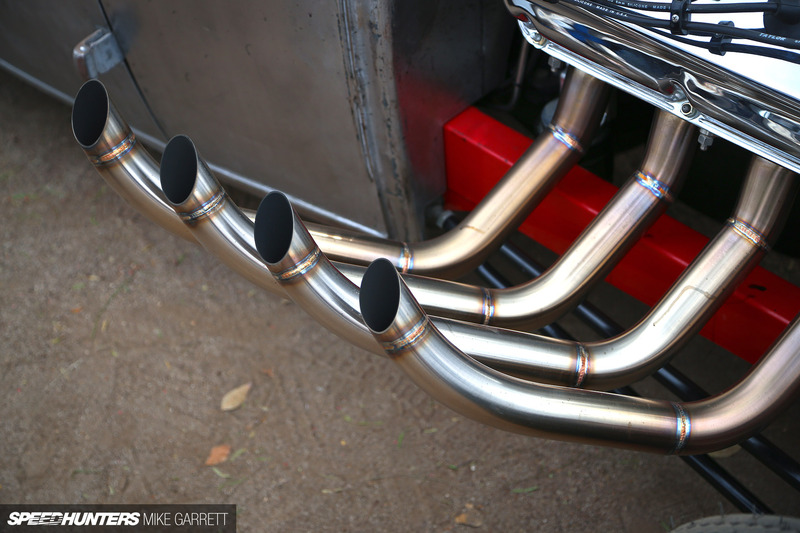 The mesh on top of the velocity stacks is a rad detail. In addition to the disc brakes as a modern concession, there's no traditional quick-change rear here, but a Moser axle (given away by the caps in the center of the rear wheels). I almost skip over this one... at first I thought this was going to be the generic chopped channelled affair... but the interior pic made me look closer. And the fact that it's completely functional yet unnecessary is fantastic. Any videos of it anywhere?